The transfer at the Apple store from my old phone (Samsung Droid) only transferred a few contacts into my new iPhone. How do I transfer contacts from my Mac computer to my iPhone (since the transfer from the old phone wasn’t complete)? Thank you. When it comes to transferring contacts from Mac to iPhone, many users have no idea about how to do that, especially for the freshmen of iPhone users. Is there any easy way to help them to finish the task? Don’t be worried, the following post will show you some easy ways to transfer contacts from Mac to iPhone easily and quickly. Speaking of transferring contacts from Mac to iPhone, the users will think it is every easy to be done. If the users have saved contacts in the address book on Mac computer, or in emails, they are able to import the contacts from the address book to their iPhone directly. If the users don’t save contacts in the address book, and want to transfer contacts from Mac to iPhone directly, they will need to find other methods. If the users switched from an Android phone to an iPhone, they can export the contacts from Android to Mac computer effortlessly. 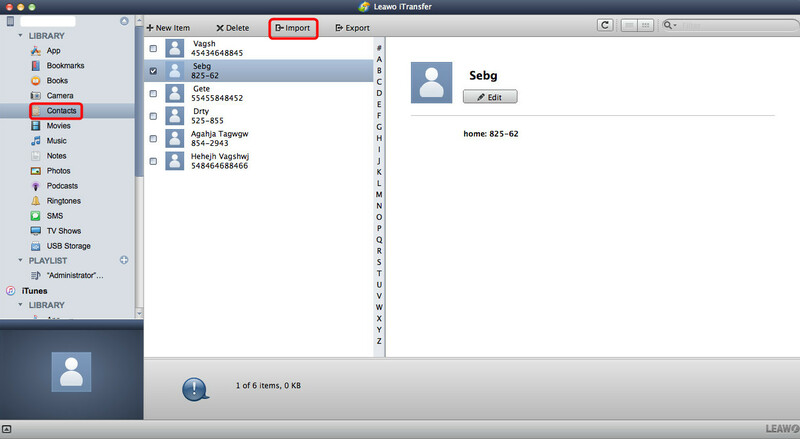 After connecting the phone to computer via USB, the users will find the “Export Contacts” option on the Android phone, then they are able to export the contacts to Mac computer in vCards. If the Mac computer doesn’t transfer the contacts to iPhone as posted, the users can take advantage of the iPhone transfer software for Mac to transfer contacts from Mac to iPhone. Among all the data transfer programs for iOS devices, Leawo iTransfer for Mac is regarded as one of the best. The program enables users to transfer files among iOS devices, iTunes and Mac computers without the sync of iTunes. It enables users to transfer various kinds of files, including apps, music, movies, TV shows, ringtones, ebooks, photos and Camera Roll, and it helps users to manage contacts and text messages on their iOS devices. The following guidance will show you how to transfer contacts from Mac to iPhone. You are allowed to free download the program to have a try. 1. Run Leawo iTransfer for Mac on your computer and connect iPhone to computer with the USB cable. The software will automatically detect the libraries of your iPhone, and then list the libraries in the left sidebar. 2. Choose “Contacts” in the left sidebar, and then the contents will be shown in the right part. Click the “Import” button at the top of the window to add contacts from Mac computer. You are allowed to add vCards and CSV files to your iPhone with this program. After adding contacts from computer, Leawo iTransfer for Mac will begin to import contacts to iPhone. A progress bar will show the percentage of the transfer process. When the transfer is finished, you will get the contacts in your iPhone. 1. Download and install the program on your Mac computer. 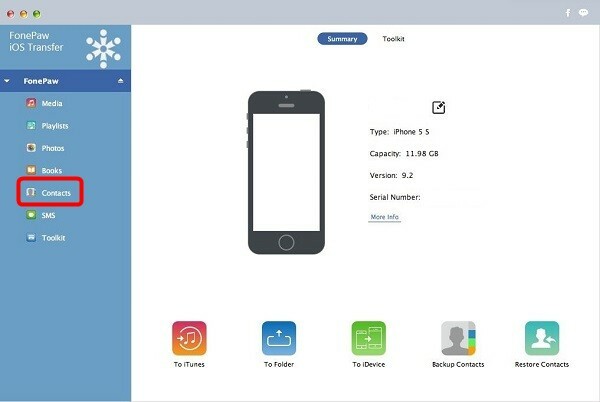 Then, launch the program and connect iPhone to Mac.The application will recognize your iPhone automatically and displays the device information in the interface. 2. In the left sidebar, click “Contacts” to bring out the contacts management window. 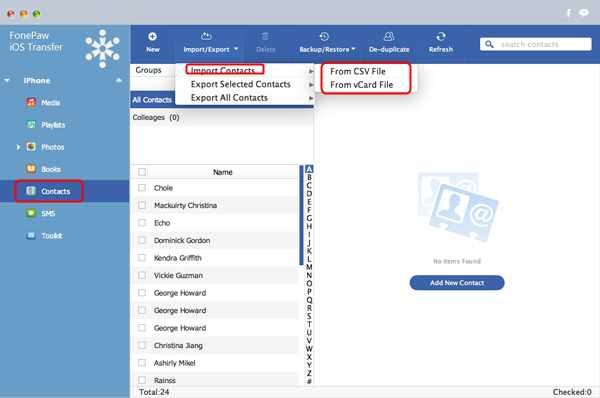 Then, click “Import/Export” and select “Import Contacts from .CSV File” or “Import Contacts from .vCard File (s)” option. Now, you can choose the source contacts file in the dialog box that appears. Then, the software will begin to import contacts to iPhone. After the transfer finishes, you will get the contacts on your iPhone. The above two iPhone transfer software for Mac are all powerful for transferring contacts from Mac to iPhone. Excepting transferring contacts, they have more funcions with some similarities and differences. 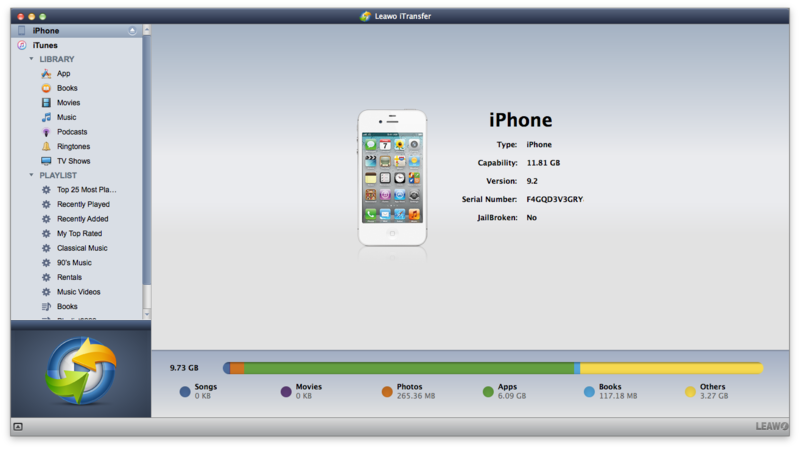 The following table will show you a comparison between Leawo iTransfer for Mac and FonePaw iOS Trasnfer for Mac. Choose anyone as you like.